Sunday, April 3, kicked off the inaugural Black Restaurant Week in Houston and of course 2 Girls Who Travel had to partake. So we decided on Esther’s Cajun Café & Soul Food, a restaurant we’d never visited before, but heard good things about. 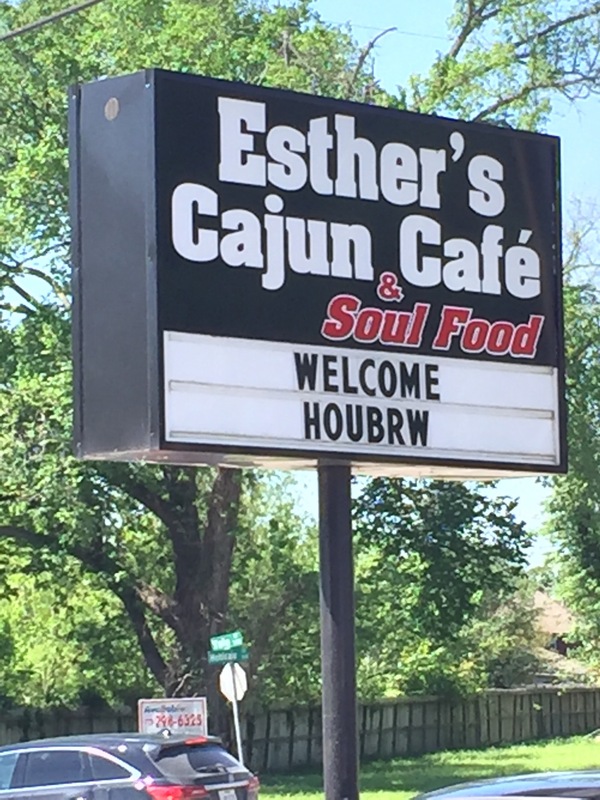 Located in north Houston just outside of 610, Esther’s serves up Cajun and soul food classics seven days a week. Since Sundays are common for people to enjoy large soulful meals, we figured it would get packed, so we opted to go just before noon to avoid the lunch rush. Turns out this was a great idea, because as more people arrived, the parking lot became somewhat of a maze to enter/exit. As we were ordering our food, the server told us that we were the first Black Restaurant Week patrons to come in. The restaurant was clean and well kept. All of the servers were friendly, attentive and detail oriented. Since it was such a pretty day, we opted to dine outside on the little patio. The area was clean and each table had a potted plant centerpiece as well as a canopy to shade visitors from the sun. And now for the food! I mean, that’s what you’re here for, right? The turkey wing was cooked just right – it was tender and falling off the bone. The cornbread dressing was homemade and was a perfect complement to the turkey. The greens were especially good and seasoned well. Sometimes, people can make their greens too salty, but these were just right. Though the macaroni and cheese tasted good, it almost seemed like something was missing. It’s hard to pinpoint … the cheese was more of a sauce than cheese. And though there was no seafood in the gumbo, it was hearty. Every bite was full of meat – either chicken or sausage. It was also seasoned well. Now the lemonade was just too sweet for my liking, but if you’re into extra sugary drinks (like Val), then it may be for you. I’ll stick to my unsweetened tea. The peach cobbler didn’t disappoint. It wasn’t too runny and the spices were spot on. Smothered pork chops are kind of my thing. It’s typically what I order at any soul food restaurant, so I consider it a good variable in reviewing restaurants. These were tender and tasty and green and red bell peppers and onions were smothered in the gravy as well. The green beans included chunks of potatoes and the seasoning was to my liking. I also enjoyed the macaroni and cheese. Nothing really stands out about it – it was just good. 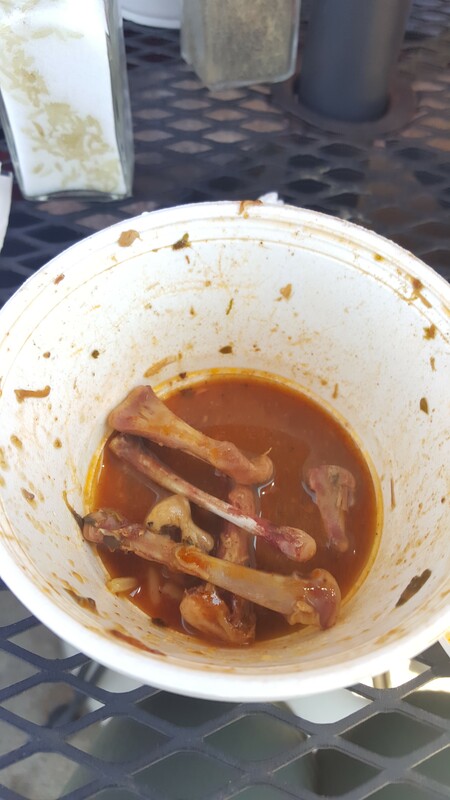 I took a bite of my gumbo and was pleasantly surprised when I didn’t reach for the salt, pepper or hot sauce. Typically, I add some form of seasoning to everything I eat. I didn’t need to with any of my food from Esther’s. I definitely have a sweet tooth, so I was very excited about my candied yams. I loved them!! They were sweet, firm but soft and not mushy. The cornbread was also sweet, so I had no complaints. The Kool-Aid was as expected, fine. Very hard to mess that up. And dessert was the icing on the cake. I love peach cobbler and if a restaurant can get that right, they’re good in my book. The crust on the peach cobbler was plentiful and it tasted fantastic. CONCLUSION: We thoroughly enjoyed Esther’s – from the service to the atmosphere to the great food. If you go during Black Restaurant Week (April 3-10), you get a cup of gumbo, a meat with three sides, your choice of dessert and a drink for $35 before tax. And trust us, that’s a lot of food. We made a couple of meals out of ours. 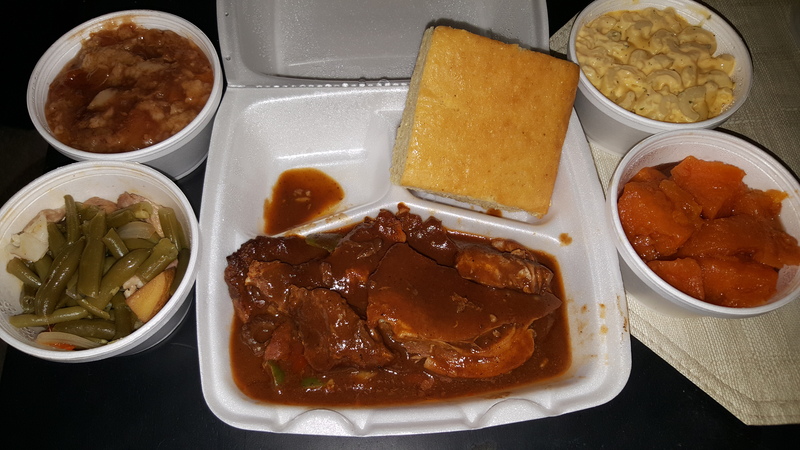 Esther’s Cajun Café & Soul Food is located at 5204 Yale Street, Houston, TX 77091.